In my previous article on scalable monitoring, I described an interesting and highly scalable low level infrastructure for monitoring servers and services. Although that proposed architecture would work without network topology information, it worked best with a certain minimal amount of network topology information - which machines were connected to which switches, and what subnets these various servers are connected to. This article proposes a high-level design for collecting and managing this network topology information. A (hostid, switchid) tuple. Depending on the protocol (CDP, LLDP) a given switch might have different types of switchids. One might be the fully qualified domain name of the switch, and another might identify itself by the base MAC address of the switch. A set of one or more (switchid, subnet-description) pairs collected per-host. For IPv4, the subnet description can be a standard CDL address/mask format. I don't know what the right terminology is for a corresponding IPv6 physical network segment. This information is sufficient for creating a basic network topology map from which one can create the 3-level ring structure as described in my previous blog post. For both LLDP and CDP, the client cannot solicit an announcement - you just have to wait for it. The default interval for CDP announcements is one per minute. This creates some complications in handling newly booted hosts since there is no way to tell when, if ever, an LLDP or CDP packet will arrive. In addition, since one can move switch ports around easily, the affiliation of a given host with a given switch can change dynamically. This implies that a general design for managing network topology must be prepared for a host to have no switch identification, for it to be supplied later, and for it to change. On initialization, send a startup packet containing network segment information for the host. Overlord is a term I used in my first article on this topic to refer to a host that is performing a management function. There may be many overlord machines performing a variety of functions, and they may be in a cluster or other method of enhancing reliability. For the purposes of this article, I will describe a single node implementation of the topology management function. Receive announcements from minions announcing their startup. When this happens, the overlord should initially add it to its subnet ring as described below. Move it from the subnet ring into the ring for its switch. Create new higher level ring(s) for its switch and/or subnet. Assign it a position in a higher-level ring. Take away its position in a higher-level ring. Give its position in higher level ring(s) to other nodes. Remove subnets and/or switches from the active configuration. Update the active configuration database with the forwarded CDP or LLDP packet. Receive "apparent death of host" notices from minions announcing that another minion has apparently died. It will need to take one or more of the following actions when this happens. Send a detailed message to a higher-level management entity. Close the intra-switch ring this host was a member of (if any) by sending the dead machine's neighbors directives telling them to send heartbeats to each other instead of the dead machine. If the ring had two nodes before, move the surving node to its subnet ring. Assign its role in higher level rings to another eligible host. Remove the host information from the active configuration. Remove a subnet or switch from the active configuration. A two-node ring - each only needs to send the other a single packet per interval - not two. A configuration with only one minion. Although there are a number of cases to be taken care of, the details resemble the well-known algorithms for inserting and deleting from doubly-linked circular lists. Of course, this case is more complex because things might fail in the middle of these various rearrangements. What comes to mind are finite state machines to handle timeout and other failure conditions appropriately. No doubt there are things I've overlooked, but this should be enough to demonstrate feasiblity and approximate level of difficulty. When a client talks to a service over a network, and the server providing the service fails, or the service needs to be moved for administrative reasons, what methods are available for redirecting network references to that service refer to a different server? This post outlines the methods that I know of for doing this. But note the word redirect - that word is the key to all these methods. These different methods are ways of redirecting various layers in the networking stack. So let's first look at what happens for a normal IPv4 network connection over ethernet, and what all layers are involved, and what all places there are to redirect (or reroute) the network traffic to another server. For simplicity's sake, we will ignore load balancers - both in hardware form, and DNS-level load balancers, and we assume a modern "switched" network. What happens when a client establishes a connection to a service on a server? Here is a brief synopsis of how connections get established. The client is given or obtains from configuration information, bookmarks, etc. a name of the server running that service. The client consults a DNS server to translate the server/service name into a 32-bit IPv4 address. The client holds onto this name/IPv4 mapping in order to optimize future references to the server name. DNS lookup libraries normally do this themselves, but some applications also perform their own address caching. The client then examines the IPv4 address, and determines which interface and gateway to send it out on on the basis of its local configuration and the IPv4 address itself. The client OS then sends out an ARP packet to determine the 48-bit Media Access Control (MAC) address of the gateway, or the server itself, if the client and server are on the same subnet. It may have this MAC/IP correspondence cached from earlier packets it had received from the server. The client OS sends out the packet to the MAC address determined in step 5 over the interface selected in step 4. At some earlier time, the switch network will have "learned" which switch port the corresponds to the selected MAC address. It does this by observing which port sends packets for that given MAC address. The switch network then routes the packet to the chosen MAC address on the subnet (this could either be the MAC address of the gateway or the server - as discussed earlier). If the server is on the same subnet as the client, it receives the packet and examines the packet to see if the destination IP address is one it provides. If it does, then all is well. If it does not, then the packet is dropped. So ends the "same subnet" case. The gateway receives the packet, and examines its routing table to decide where to route the packet to. This is determined by the routing protocol the gateway is running - for example, OSPF or BGP. The "network cloud" routes the packet to the "final gateway" on the same subnet as the destination server. As before, this is determined by the various routing protocol(s) along the way from the first gateway to the last one. (This explanation is similar to the "then a miracle occurs" in the middle of a math proof). The final gateway sends out an ARP packet to determine the MAC address of the destination server. It is typically cached for a few minutes up to an hour. The final gateway then sends the packet out to the MAC address above over the selected interface based on the routing protocol it is running. The destination server receives the packet and examines the packet to see if the destination IP address is one it provides. If it does, then all is well. If it does not, then the packet is dropped. Translation from "conceptual knowledge" of the server to the DNS name of the server. Translation of the destination IPv4 address to the destination gateway using routing information. Translation from the destination IPv4 address to the destination MAC address. Translation from MAC address to destination switch port. Each of these transformations is a place where a redirection can occur. The conceptual knowledge layer can be redirected by telling all clients to switch to a new server name. The DNS layer can be redirected by updating DNS entries. The network routing layer can be redirected by updating routing information in the network and pushing out the new route information. The IPv4->MAC layer can be redirected by updating the ARP information and forcing the various ARP caches to be updated. The MAC->switch port can be redirected by updating MAC addresses and forcing the switch network to learn the new MAC->switch correspondence. Subsequent sections present detailed explanations of how to perform these various kinds of redirections. There is no universal automated to update the conceptual knowledge layer - nevertheless, server relocations are sometimes handled at this layer. One can use automated client update tools to update client configuration files, one can use word-of-mouth, email, or any number of ad hoc tools. This is the least commonly used method for redirection on failure. Arguably, since it is hard to automate, it doesn't have much place on a blog on managing with automation. Updating the DNS layer can be easily automated. The advantages are - it's universal, and little or no prior preparation has to occur, and no server/network political boundaries have to be dealt with, and the two servers don't have to be on the same subnet. The disadvantages are - not all clients use DNS addresses, Client OS DNS caching can interfere, Client software itself can interfere by caching the address outside DNS. Even with Dynamic DNS, it can take minutes to hours for changes to propagate and the new server address become known (and usable) to all clients. If the client application caches the address itself, then client applications have to be restarted. This last subcase can be difficult to automate. If a server fails, routing can be used to redirect the traffic for the failed server to another server on a different physical access segment. The advantages of this are - the two servers don't have to be on the same network segment, routing protocols are designed to deal with this kind of situation. The disadvantages include - if the IP address is public, then you have to move over at least 256 addresses at a time, there are often political boundaries making it hard for servers to automatically update network routing information, the additional routes for handling a large number of such movable addresses may slow down the routers involved. When a server fails, another server can bring up the IP address of the dead service, update the ARP cache (typically using gratuitous ARPs - sometimes called ARP spoofing) and packets destined for the now-dead server go to the live one. The advantages include: IP address takeover can occur in less than a second, there is well-tested software for doing this, most organizations have a good method for allocating and managing additional IP addresses. The disadvantages include: The two servers have to be on the same network segment, some organizations lock down their network gear to make this "impossible" (which it doesn't - it just slows it down), and it typically increases the number of IP addresses needed by the servers and services. MAC address takeover is a technique where a given network card is given multiple MAC addresses - one for an administrative address, and one for each group of independently-failable services. Retraining the switches to understand which switch port services the given MAC address is accomplished by simply sending any IPv4 packet with the new MAC address. The advantages include: Takeover can be very fast and quite reliable. The disadvantages include: the two servers have to be on the same network segment, some organizations lock down their network gear to make this "impossible" (which it doesn't - it just slows it down), and it typically increases the number of MAC addresses needed by the servers and services, organizations almost never have methods for allocating and managing MAC addresses like they do IP addresses. For servers on the same VLAN (or network segment) - IP address takeover (IP address spoofing) is the most common. Note that there are some circumstances in which there is no easy answer. You may have to change your network configuration, solve political problems, buy an external netblock, or execute various other combinations of uncomfortable or difficult steps. Traditionally, the way people have implemented high availability is by using a high-availability management package like Linux-HA, then configure it in detail for each application, file system mount, IP address and so on. This traditional method works quite well, but can be a bit labor intensive - particularly when using custom or uncommon applications. You may have to understand the structure of your applications, write some resource agents, debug them, and test them in detail. In addition, every time you change your mount structure, or other details you've told your HA system, you have to be sure and update your HA configuration to match - or it might not fail over correctly the next time. When you have good resource agents, your HA system will also recover from application failures - by restarting applications that have failed. This is a good thing. On the other hand, this is enough work that virtually no one runs all their applications in an HA configuration. It's just too much work for most applications. I call this traditional boutique-like method "HA at retail". It works well, but it is a little costly to set up and maintain all the details just so. With virtualization, another approach is possible, and (big surprise), I call it "HA at wholesale". In this paradigm, instead of needing to write scripts for each type of application, you just have one resource agent - one for managing a virtual machine. You also don't need to know the structure of the applications - the OS still starts them in whatever way it has been starting them all along. Wow, this sounds good - less work, fewer chances for errors! As expected, there is still no such thing as a free lunch here - you do wind up with some disadvantages. For example, you can no longer easily detect the failure of an application. In addition, if an application fails, the only thing you can do about it is reboot the entire virtual machine. Inevitably, this takes longer than just restarting the failed application. When coupled with hardware predictive failure analysis and smart HA software, outages can sometimes be completely avoided. HA software like Linux-HA can manage either type of environment. In an ideal world, one would like to be able to do both in the same software infrastructure. The computing industry has lots of trends, numerous buzzwords, and a number of hot topics. Sometimes these are in conflict with each other, or at least start out that way... But, in the end, there are often good ways to harmonize all these various things. Let's wander into virtual machine territory again today. If you have gone to the trouble to create a bunch of virtual machines, the chances are you hope to do a little server consolidation - because when that's properly done it can save you some money. This sounds good, and indeed has lots of good things going for it. It's buzzword compliant, it's green, it saves you green (money). What's not to like? If you put all your virtual machines on one physical server, then if that server fails, you lose all your virtual machines. If you put ten virtual machines on one server, then the impact of that server crashing is roughly ten times as great as if a single server crashed. If you work at it, you might be able to consolidate the ten most critical virtual machines onto a single server - and bring your entire data center to a halt with just one crash - bringing a suddenly much more personal meaning to the term "shock and awe"
This is not typically what people are looking for in their data center - and could easily be one of those career-limiting mistakes that you'd like to avoid - unless you already have your next job lined up. This falls under the "putting all your eggs into one basket" way of doing business. This part of a famous quote - but not the whole quote. Mark Twain said "Put all your eggs in the one basket and --- WATCH THAT BASKET". So, to follow Mark Twain's advice, we need to not just put our eggs into one basket, we also need to watch that basket. As most of you already know, watching servers and services is most commonly done by high-availability software - something like Linux-HA. A properly configured HA system will watch the basket for you, and keep the worst from happening to your basket, your servers or your career. As you can see, doing virtualization for reasons of consolidation doesn't make much sense unless you also add management software (HA software or otherwise) to watch your basket of virtual machines for you. In the end, it's easy to see that all these things are connected - virtualization, server consolidation, power savings (green computing), availability management, and you want to manage them all. Usually when people talk about virtual machine snapshotting, they include with it snapshotting both the server and any filesystems its directly connected to. Although this is more complex than just snapshotting the virtual machine, it isn't that hard. This works in some very narrow technical sense for some few cases, but it involves loss of data in every case. If you take a checkpoint every 30 minutes (or every 5 or whatever), then all the updates made during that period of time, are lost when you restore this snapshot and its storage to a consistent (but old) state. This means that all the checks you deposited during that time, or all the bonuses your boss put you in for during that time, or the books you ordered, or whatever, are lost. Lost to the point that they probably have to be restored manually - to the tune of great customer dissatisfaction. In addition, if this application has connections as a client, or as a server to other servers or clients, then although the application and its immediately mounted storage are now consistent, but unless you do simultaneous snapshots between this virtual machines and all the world it is connecting with (some of which may be outside your enterprise), and then restore your entire world to this older state, then there are likely to be many client/server connections which will no longer work - because the client and server are in mutually inconsistent states. The worst case of this is if you have a Service Oriented Architecture, where any given server is only a small part of the overall service - every service has connections to something else all the time, and to make matters worse, the clients and/or servers are often outside your own enterprise. And, of course, don't forget that you lost transactions in the process too. So, a reboot interval of 1 to 3 minutes sounds really good by comparision. Because all you'll lose in that case is transactions that were not yet committed - which are many fewer than the number of transactions lost by backing up to the previous checkpoint. As an example of a common special case where this obviously doesn't work, imagine that the server in question is a file server. So, you restore the virtual machine and all its storage (the file server) to some older state. Now all the connected applications which _thought_ they had committed some particular piece of work (a spreadsheet, a database transaction) - just had all that work undone. And, depending on the file server protocol and the application, bad things will happen - certainly loss of data, and probably some of the applications will create corrupt data - since updates they thought they'd made are now gone - unbeknownst to them. This corrupt data can cause any number of problems - inability to make further updates, cascading application crashes - these are all possibilities. Or what if it's a client of a file server? The file server is a separate machine (possibly virtual, possibly real, possibly an appliance). Then you can't put its storage state back to a known state - without restoring all its clients back to the same consistent state - and if you somehow did, then _all_ of them now suffer data loss. In two earlier posts  , I gave brief descriptions of the quorum server which seem to have left as much confusion as they provided clarity. 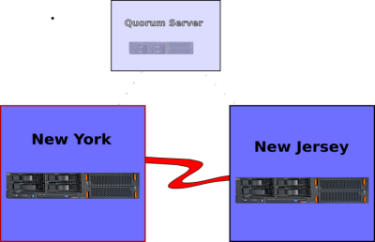 This post is only about the Linux-HA quorum server, and includes illustrations for clarity. In the Linux-HA quorum API, you can configure a number of quorum modules which are used as follows. If a quorum module returns HAVEQUORUM, then the cluster has quorum. If it returns NOQUORUM then the cluster does not have quorum. If a quorum module returns QUORUMTIE, then the next quorum module in the list is consulted. If the final module returns QUORUMTIE, then it is treated as a NOQUORUM event. The quorum daemon is normally used in conjunction with the nomal arithmetic voting quorum module, so that it is only consulted when the number of nodes in the cluster is exactly half the number of configured modules in the system. So, it is worth noting that the quorum server will never be consulted if a cluster has an odd number of nodes. Below, I'll go through the basic quorum server cases so you can see how all this works in more detail - with pictures, even! In the picture above, everything is normal. The quorum server is up, and both sites are also up. Because the cluster has all its nodes up, the quorum server is irrelevant. In the situation above, we show the "New Jersey" site as down. In this case, the conventional voting quorum has a tie (1/2 - exactly half of the nodes). In this case the quourm server is consulted. 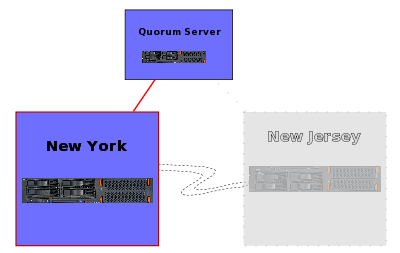 Since only New York is talking to the quorum server, the quorum server grants quorum to the New York site. In the case above, the link between the sites has been lost, but both sites and the quorum server are all up. 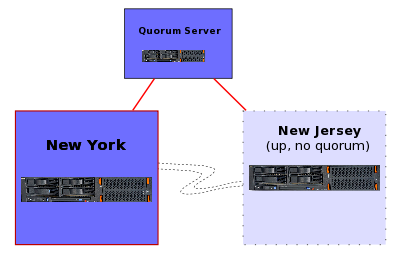 In this case, both New York and New Jersey contact the quorum server because each sees 1/2 nodes as being up - resulting in a tie condition. 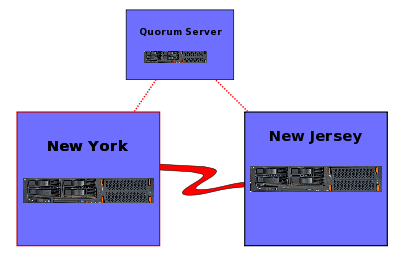 In this case, the quorum server will choose one of the two sites to provide quorum to, and I assume in this case that New York was chosen. Because New Jersey wasn't granted quorum, it will shut its resources down. What happens when the quorum server goes down? That is the situation shown above. Because New York and New Jersey are both up, they have 2/2 votes and both provide service as they should. This illustrates the point that the quorum server is not a single point of failure. In this final case, multiple failures have occurred - both New Jersey and the quorum server are down. 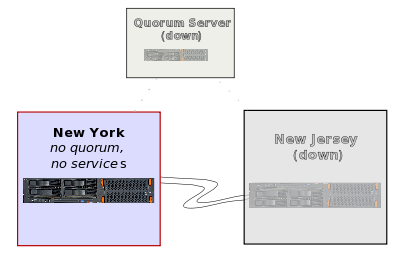 In this case, New York doesn't have quorum, so it shuts down services and none are provide by any node in the cluster. Of course, this situation can be overridden in the cluster configuration by changing the quorum policy, but from an automated perspective, this is all that can be (should be) done.